Many of us are aware of the importance of drinking enough water. Getting our daily dose of water helps our organs perform their functions, keeps our skin clear and hydrated, and allows physical action in our bodies to flow smoothly. Even with this knowledge, it can still be challenging to drink all the water our bodies thirst for daily. Drinking plenty of water is critical. Those who are not drinking enough may experience poor digestion, sluggish thinking, skin breakouts, headaches, bad breath and general fatigue. Also, drinking tea or juice and eating raw fruits and vegetables, in addition to your daily water intake, contributes to the hydration process. When you are heading out for the day, automatically reach for your bottle of water. (To protect our environment, please consider using refillable water bottles). The color of our urine has been used as a tool for diagnosis since ancient times. Experienced health professionals can tell a lot about what’s happening in the human body by the color, density, and smell of the urine. I believe that physical observation is the first step towards understanding the health of our body systems. Education is empowerment. By understanding what’s happening in our body we can better partner with our health care practitioner to properly diagnose any illness. Urine Color can be affected by what you eat, medicines you take, laxatives, what you drink, and any other injected or ingested substance. This information* is presented only as a guideline and is not intended to replace medical advice. No Color (Transparent) – You may be drinking too much water and may wish to cut back. Amber or Honey – Your body needs water. Drink some water now. It’s not getting enough. Syrup or Brown Ale – This color may indicate liver disease or severe dehydration. Drink water and consult with your doctor. Pink to Reddish – Have you eaten beets or blueberries lately? If not, you may have blood in your urine. It could be NOTHING or it could be a sign of a serious medical condition, such as: kidney disease, tumors, urinary tract infection,prostate problem, or something else. PLEASE CONTACT YOUR DOCTOR. Orange – You may not be drinking enough water, have eaten something with a food dye, or you could have a liver or bile duct condition. PLEASE CONTACT YOUR DOCTOR. Blue or Green – It’s probably something you ate that had a certain food dye. It could also be caused by certain rare genetic diseases or bacteria. PLEASE SEE YOUR DOCTOR IF IT PERSISTS. Foaming or Fizzing – If this occurs occasionally, it’s probably harmless. But it COULD indicate excess protein in your urine. If you are seeing this often, please consult with your doctor. 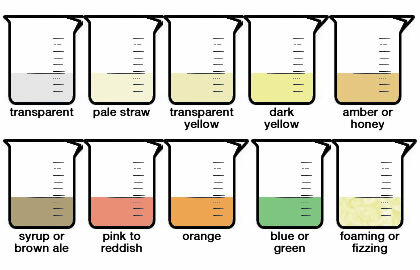 Remember that you can see a lot from your urine but it does not replace the information you can get from a urinalysis. Get regular checkups. Blood in the urine is often invisible to the naked eye and elevated glucose levels in your urine may indicate diabetes. As a Civil Engineer, I am cognizant of the expected population growth that will precipitate an increased demand for drinking water in the next 20 years. I am also very appreciative of the work that has been done to bring water to the population centers by the workers who actually built the water treatment and distribution systems that allow us to have potable water at our fingertips. In one of his technical papers, Dr. Daniel A. Okun, Professor of Environmental Engineering, Emeritus at the Univ. of North Carolina in Chapel Hill, provided a brief history of how water was first brought to our cities. Having said that, we have to bless the people who have built, operate and maintain our water treatment systems. We must also be aware of the damage that is done to the water crystals by the harsh chemicals and the actual transportation of the water through the pipes. That is why I’m so excited when I see the research of Dr. Masaru Emoto. He has proven, through research and technology, that music can actually correct distorted frequencies within water molecules. For centuries, we have turned to classical music for relaxation and healing. In his book, Water Crystal Healing – Music and Images To Restore Your Well-Being, internationally acclaimed water researcher Dr. Masaru Emoto, presents an incredible collection of music and water-crystal photographs that have been found (through his research) to benefit those who suffer from common physical and emotional imbalances. During his research, he discovered why certain music and thought patterns have healing benefits. What he found was that the rhythm, tempo, tone and melody of the music can actually correct distorted frequencies within the cells of our body. What is presented in his beautiful book is that the combination of images, words and music concentrates consciousness and provides a unique experience for healing. As an Engineer, I am fascinated with the research methodology Dr. Emoto utilized. He used micro-cluster water and magnetic resonance analysis technology. In his various books, the first of which was published in 1999, Dr. Emoto, a doctor of Alternative Medicine, introduced the novel idea that water not only reflects the physical word around it (as when we use a placid lake or pond as a mirror), but it also reflects the consciousness of the being surrounding it. The experiment he used to discover this included bottles filled with water, that were set under either a positive or a negative influence. For example, some bottles of water were wrapped with written notes, with the writing facing inside the bottle that said, “thank you.” This was done in various languages. No matter what language was used, the water in these bottles, when frozen, created complete crystals that were lovely to behold. Water over which a priest prayed, with love and gratitude, created the same type of crystals. Conversely, unpleasant, incomplete, and malformed crystals were created in water exposed to people saying or writing, “You fool,” or other negative expressions. Let’s remember to take a moment before we drink to bless the water that gives us life.